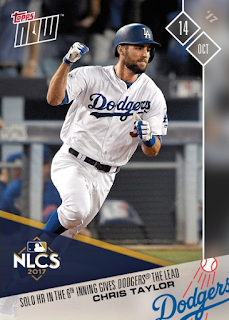 "He just carries himself well," said Dodgers manager Dave Roberts. "Doesn't get too high, doesn't get too low. People use that word 'poise' a lot, but he has poise. And in big spots, he has the ability to zone in and swing at strikes and take balls. So he's done that all year for us." 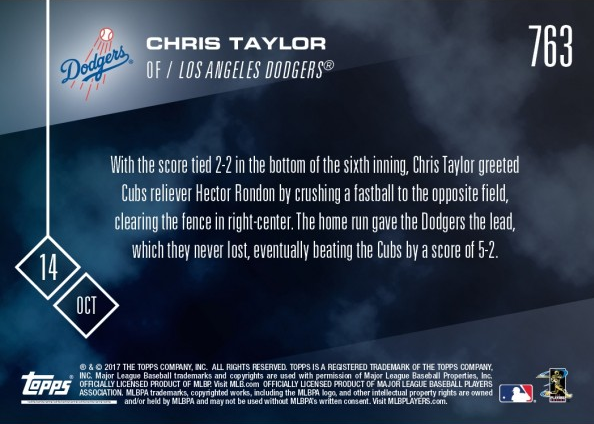 With the score tied 2-2 in the bottom of the sixth inning, Chris Taylor greeted Cubs reliever Hector Rondon by crushing a fastball to the opposite field, clearing the fence in right-center. 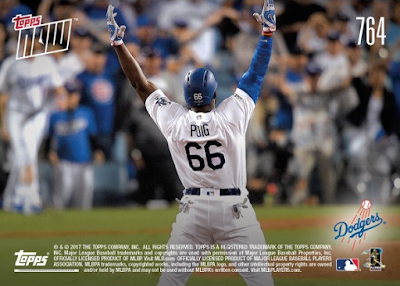 The home run gave the Dodgers the lead, which they never lost, eventually beating the Cubs by a score of 5-2. 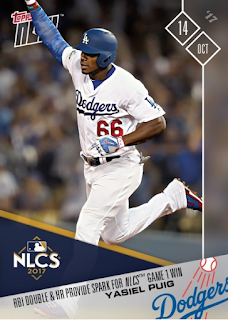 The second card available celebrates Yasiel Puig's fantastic evening at the plate. Puig again was the driving force behind a Dodgers' win on Saturday night, a come-from-behind 5-2 victory over the Cubs in Game 1 of the National League Championship Series presented by Camping World. He sparked the game-tying rally in the fifth inning with an RBI double. Two frames later he launched his first career playoff homer, giving the Dodgers a two-run lead. "It's great when he can play with such emotion and focus as well," said Dodgers skipper Dave Roberts. "He loves the big stage."